CityWatch is an example of quadruple helix innovation between Trinity College Dublin, Intel Labs Europe, Dublin City Council and citizens. It aims to exploiting the myriad of sensor data available in cities to manage their limited resources better, harness the power of the crowd via participatory sensing, integrated with other data sources (fixed sensors, open government data and social networks). It also supports high-volume streams of sensor data originating from diverse, intermittently-connected mobile and fixed nodes, as well as assessing the quality of information contributed by users while maintaining their privacy. It enables useful urban applications in the domain of urban transportation, environmental monitoring, and health-care. Participatory Sensing: Harnessing the power of on board sensors found in citizens smart devices. Open Government Data: Using open government data sets from Dublinked. Data fusion: Integration of heterogeneous urban data sets from fixed city sensors, open government data sets and output from citizens smart devices sensors. 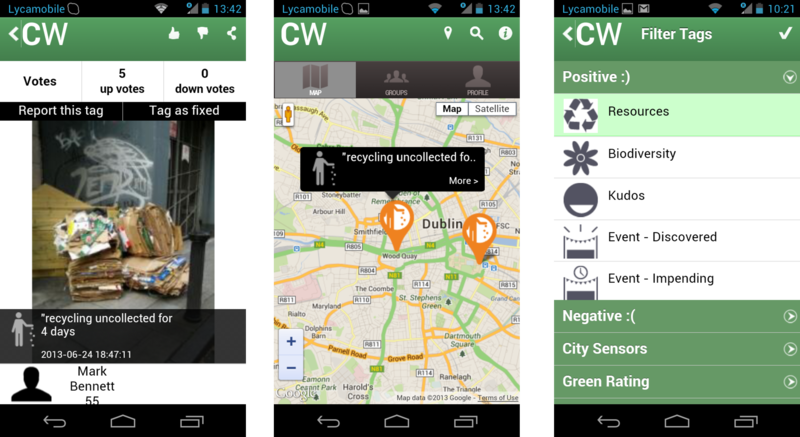 Gamification: Users are able to tag positive and negative issues in their city which may be of interest to others. Tagged items can be shared across other social networks and the “taggers” will get points, which they can exchange for city rewards. Points are rewarded at an individual user and group level. All points are collated to display each area’s "Green Rating“. Competition between users and between areas encourage participation. The first CityWatch use case aims to harness the power of the crowd to encourage sustainability in cities. It includes three steps. First, signal wasteful behaviours such as lights on at night in office buildings, buses idling and windows opened in heated buildings. Second, highlight positive green initiatives such as urban Community Gardens and environmental talks and lectures. 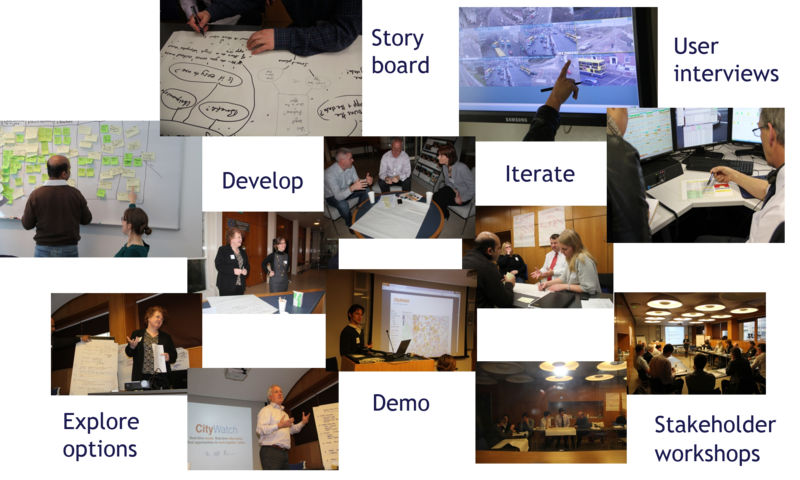 Third, provide a dynamic green map of Dublin, creating the impetus for a greener Dublin. For more details you can see also check the CityWatch page.